We offer the best evacuated tube collectors in the industry, manufactured by Apricus, which absorb sunlight and convert it into usable energy as heat for radiant heating, domestic hot water, pool heating, and more. They are very efficient, even in climates that are cold and don’t receive direct sunlight during the winter. A vacuum between the two glass layers insulates against heat loss. 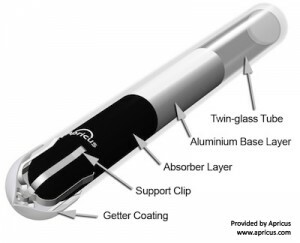 The evacuated tube design used by Apricus was originally developed in the 1980s and has proven to be extremely robust. Referred to as the “Sydney” tube, “twin-tube” or “all-glass”, the tube is essentially two glass tubes that are fused at the top and bottom. The inner tube has a solar absorbing coating, and the space between the two tubes is evacuated to form a vacuum. The tubes are made from a type of glass called Borosilicate, the same base material as used in many Pyrex glass products used in kitchens around the world. Borosilicate glass has the characteristic of being very strong and also has excellent light transparency (>92% @ 2mm thick) . The wall thickness of the glass greatly impacts the strength, longevity and naturally also the cost. Apricus evacuated tubes are custom made to strict requirements that exceed the industry standards, including a 1.8mm thick wall ensuring excellent strength and resilience to hail impact. To confirm the strength of the tubes, each batch of evacuated tubes assembled in the Apricus factory have randomly selected samples tested by dropping a 30mm / 1.2″ diameter steel ball onto the tube from various heights. Below is a video example. The name “evacuated” is used to describe the process that expels the air from within the space between the tube tubes, forming a vacuum. A vacuum is an excellent insulator against heat loss, and so evacuated tubes are able to operate very efficiently when there is a big difference between the inside of the tube and the outside ambient air. For this reason evacuated tubes are the ideal choice for high temperature hot water applications or locations that get cold in the winter. In order to help maintain the vacuum over the 15-20 year life of the evacuated tube, a barium getter “soaks up” any remaining gases in the evacuated chamber plus any fresh gases such as Nitrogen that can slowly permeate through the glass over time, a process known as out-gassing. This barium layer also provides a clear visual indication of the vacuum status; the silver-coloured barium layer turns white if the vacuum is lost making it easy to identify a fault tube. The absorber coating comprises a base layer of Aluminium on the outside of the inner glass tube followed by thin layer of the dark coloured AL/N material. These coatings are applied using a method called dc reactive sputtering which is extremely reliable after having been finetuned over the past 20 years since it was developed. The combination of the highly efficient absorber coating and the vacuum insulation means that the coating can be well over 200oC / 392oF and the outer glass is cool to touch. In strong sunlight, each evacuated tube can provide over 60 Watts / 204 Btu of water heating output.